WHAT LIES BENEATH THE EASTERN PLAINS? Our trail through the Pawnee National Grasslands winds through a beige moonscape, past fins of blond earth and the tan flanks of bluffs in the great eastern plains of Colorado. Footprints fill these dry sandy creek beds instead of running water. We hike straight out and back to the Pawnee Buttes, sandy pillars that erupt out of an otherwise flat landscape. We see a few hikers, then fewer, and by the time we arrive at the East Butte, there’s just one group of four huddled at the base of the butte. Their voices are the only sound we hear as we approach, other than the wind hissing over the dry grass. The longer we hike, the more colors emerge from the landscape—there’s rust, sage, gold, emerald, lavender, pink. Pellerite fell in love with wide open spaces working as a ranch hand and hunting guide in eastern Montana. Now, through the Colorado Prairie Initiative, he campaigns for better care of these places and the wildlife that find a home here, advocating for reintroduction of bison and eradication of invasive Russian thistle (a.k.a. tumbleweed). The Colorado Prairie Initiative has also been pressing federal agencies to responsibly and sustainably manage the oil and gas resources that lie beneath what’s left of the Great Plains. New technology and increasing demand for those minerals has called for the reassessment of how the federal government oversees them. 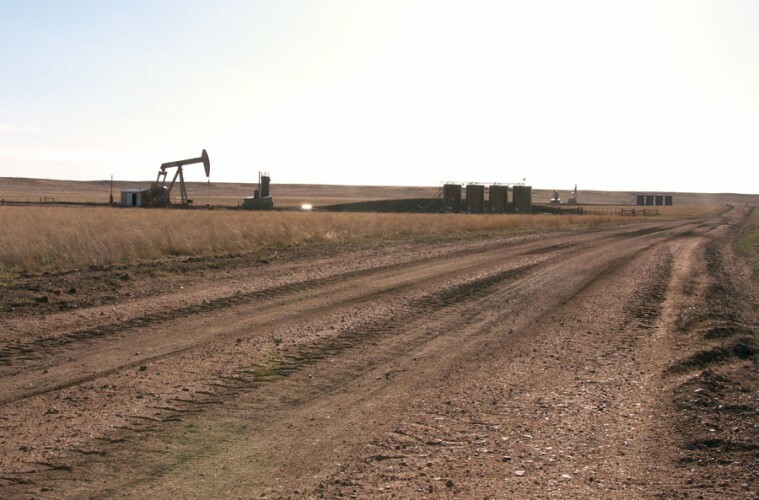 The U.S. Forest Service has recently completed a two-year process to assess existing oil and gas development on Pawnee National Grasslands to determine how to handle more leases in that area. Their decision proposes oil and gas companies use horizontal drilling methods to access oil and gas without leaving a footprint on the grasslands. All un-leased lands on the Pawnee National Grasslands to be available to lease—yielding royalties of more than $240 million—with a stipulation against locating wells and well pads on those lands. The Pawnee National Grasslands encompasses a 30-by-60-mile area of prairie in northeastern Colorado. The place is popular for camping, bird watching and hiking, and it includes the geologic anomaly of the Pawnee Buttes. Land ownership is a checkerboard: Those who still own and ranch or farm on the land, and public land purchased back from those tired of working on these arid plains that often yield more in dust than in corn or cattle. All of it sits over the top of the Denver-Julesberg Basin, considered by energy companies among the hottest oil and gas plays in the country. It’s not the only energy source at work here. On the northern horizon, windmills stretch out into the haze, sending electricity back to cities to the south. Public Pawnee land has 62 currently active oil and gas wells. Driving through the area, it’s easy to count more wellheads than that, and condensate tanks to collect oil or gas or produced water cluster together up to 30 at a time. Most of those wells are situated on private land and have provided ranchers and farmers with a financial boost in a cash-strapped time. Oil and gas exploration in this area dates to 1950, but the real run on minerals here began in 2009, around the time horizontal drilling technology was developed and hydraulic fracturing, or fracking, became the prevailing method for accessing oil and gas in shale reserves. That technology made possible the decision signed off by the Arapaho Roosevelt National Forest and Pawnee National Grassland that opened the way for the Bureau of Land Management to lease 44 parcels for oil and gas development in the Pawnee National Grasslands last month. One of the major oil and gas companies working in the area, Noble Energy, also announced it plans to dedicate more than 60 percent of its onshore drilling budget to developing Colorado’s oil and gas reserves. But these and future wells here will be established outside the grasslands and drill up to two miles into it. “Allowing the leases to take place, but not allowing any surface occupancy, they can go underneath the grassland to retrieve those resources and not have to necessarily build as many wells on private land,” says Reghan Cloudman, public affairs specialist for Arapaho and Roosevelt National Forests and Pawnee National Grasslands. This plan was seen as posing the least risks of adverse environmental impacts to wildlife, scenery, fisheries and recreation as well as the risks of soil, surface water and groundwater contamination. Associated effects of oil and gas, including traffic from well sites, emissions, road development and pipelines, are also expected to be limited. The forest supervisor contends the plan reduces the environmental impacts of the activity by consolidating it. The options considered included banning leases altogether, but according to the Forest Service’s analysis, that course of action might have created inefficiencies in accessing minerals that increased surface land disturbance, wells and well pads by 10 percent to 50 percent. Banning leasing would also fail to foster development of resource-based industries, as called for by the guiding legislation for the Forest Service, and cost the federal government their 12.5 percent royalties on 412 million barrels of oil and 815 thousand cubic feet of natural gas. The Forest Service estimates $241 million in federal royalties; 1,600 direct, indirect and induced jobs; and a $99.7 million per year contribution to the region’s economy for 30 years. The Forest Service received an estimated 2,500 letters on the project. Much of the public concern centered on the use of fracking on the grasslands, Cloudman says, but that’s a matter for the Bureau of Land Management. Environmental and hiking advocacy groups have objected that ongoing oil and gas development may further compromise the shortgrass prairie ecosystem and the experience for those who hike, bird watch or hunt there. Not everyone out here agress with Nichols, however. Leonard Ball’s family has been cattle ranching in the national grasslands since 1914 and he still runs about 400 head of black angus cattle on his 15,000 acres. The impacts of the oil and gas boom of the last few years are minimal, he says, and he’s confident that the industry is well-regulated and safe. When his grandfather bought the Lazy S Over S ranch property, he got the mineral rights with it for an extra $1 per acre. A few years ago, Ball was able to lease those mineral rights to an oil and gas company. It wasn’t even a very good well, he says, but it’s made a big difference. “We’re 100 years old this year, and it actually put money in the bank to where we’re debt-free, and we’ve never been debt-free,” he says. Companies rent access to the land and pay a percentage, usually 12 to 15 percent, of whatever comes out of the well. Some farmers and ranchers, who were coming out of an era in which cattle prices dropped and hay prices soared, got $200,000 to $250,000. Pawnee isn’t on the way to anything. You might not even be able to get to the Pawnee Buttes on purpose—one of the signs is barely legible and the directional arrow totally obscured by dust. What makes it worth fighting for? Pellerite’s biggest worry is that when people look at it, they say what they first see: Nothing. Elizabeth Miller has been covering environmental issues for Boulder Weekly since 2011.